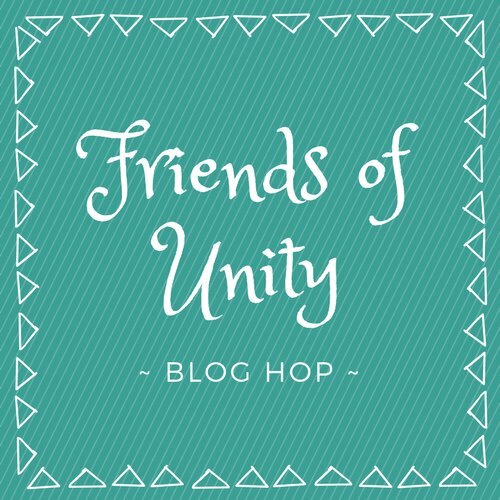 Hello and welcome to our friends of unity march blog hop. This month our theme is new beginnings. For this hop I decided to not make a card, but a gift instead. I made a covered notepad. I taught this at one of my Stampin Up workshops several years ago, and have enjoyed making these ever since. They are quick and simple to assemble, and can be made easier if you use patterned paper for the background, but for this one I CASE'd one of the design teams ideas and stamped the background. As with any and design, sometimes the hardest part can be "what colors do I use?" Unless I am specifically making a card for a baby shower or a wedding... I tend to stay with colors that I favor. That is exactly what I did here. My favorite color is purple, but my favorite color to stamp with is blue. Inside there is a pocket to slip a card or other small notion to your recipient. Like the card you see? Maybe you missed my blog post from last week. Check it out here for the card details. One piece of card stock cut to 8"x11". Score this on the long side at 5-1/4" and 5-3/4". This creates your cover. Another piece of card stock cut 5"x 2". Score this on the short side at 1" and 1-1/4". This creates the cover over the top of the notepad. Be careful when gluing this one that you only glue to the top of the notepad and not the paper. The last piece of card stock is cut 6-1/2"x 4-3/4". Score one short side and both long sides at 1/2" and 3/4". You will need to cut the corners away where the scoring lines cross. This creates your pocket. As for the front... decorate that as you wish! ***FYI... I strongly suggest using a liquid glue for all portions of assembly with this project. Double sided tape, glue dots, etc simply will not hold up. Hop along with the other Friends of Unity and see their creations. Psst... There is also a giveaway! Lovely gift idea, Eileen! I love notepads!! I seem to collect them more than use them. This turned out really sweet. I love it! This will be a keeper once you realize how quick and easy they are to make. Great gift idea! Thanks for clear instruction. I really like this! Thank you. These are really simple to make. I really like the background you created with the arrow with hearts. Pretty card! Great gift idea! I love that bird! thanks for sharing. I'll def be making one of these in the future. Thanks! They are fast and easy to make. Very nice! A lovely sentiment and a bird. This is a great idea for a gift!!! Perfect for office gifts too. Quick and easy to make also. It is super quick and easy to do. Especially with a group or even kids. What a great idea - pretty AND useful! I need to start on one of those right now! The notebook is 5 x 8?? Yes! I just updated my blog to include the notepad. Eileen, this is a wonderful gift idea! Love the pairing of the bird with that beautiful sentiment. This is so great!! Love those arrows, and the notepad is such a great idea!! Thanks for the inspiration!! What a great gift!!! I need to case this for my mother and mother -in-law!😊 I love the brown and blue combo! Love this idea. I am going to make that and include some thank you cards in the pocket. Beautiful! Thanks for this idea. I’ll be scouting out the notepads to make these for the teachers at my school. And as simple as this may sound, I needed the reminder to stamp with colored ink. Thank you! This is beautiful and so creative! Thanks for sharing how it was made!!! What a lovely gift idea!!! This is a great idea. Blue and brown make a good combination for anyone. Eileen I love this gift idea!!! Beautiful!!!! I can't wait to try it. Thanks for including the directions. Great idea ! I can see this for gifts for teachers, thank you" s birthdays whatever!!! Thanks for sharing the idea!!! Great project. Love the colors, details, and design. Great ideas for gifts. Thank you. great idea....now to find the extra time to create this!!! Beautiful! I use to make these but haven't in a long time. Honestly, I forgot about it until now. Thanks for making this project and sharing it with us! Sweet! Love that it can be a gift. So creative! Love this idea for a gift! And I even already have this stamp. Woo Hoo .. I can give it a try soon! !